Whalen traveled to Albany with 7 Eyewitness News and was given a seat in the senate chamber and called by name on the senate floor by Senator Tim Kennedy, D-South Buffalo. ALBANY, N.Y. (WKBW) — For Michael Whalen, the long road to justice started early last year. Hundreds of abuse survivors took his advice, sparking a scandal that led to a federal investigation and almost took down Bishop Richard J. Malone. But nothing compared to Monday’s vote by state lawmakers to reform New York’s archaic sexual abuse laws. “It’s just been an amazing year,” he said. The unassuming guy from South Buffalo was embraced by the most powerful people in New York State. At times, it seemed surreal, he said. 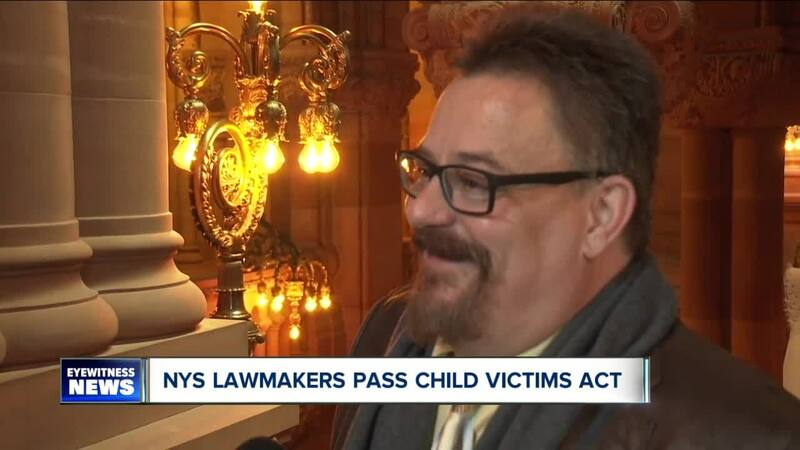 “[I’m] excited...scared...But relief, mostly relief that it’s finally gonna happen, that this Child Victims Act is finally gonna pass,” he said before the vote. The new law raises the age abuse survivors are able to report the abuse to police from 23 to 28 and it raises the civil statutes of limitation from 23 years to 55 years of age -- which is around the age most abuse victims finally come forward. When the bill was passed unanimously in the senate, 63-0, it was hard for whalen to mask his emotions as he wiped tears from his face. He said he did it for his kids. “They see that I’ve fought the good fight, you know?” he said. And for people like his grandchildren and children in future generations. “My kids, my grandkids -- any harm that comes, they have the power now, God forbid that anything happen,” he said. When a senator simply apologized from the senate floor, Whalen removed his glasses, exhaled loudly and wiped away tears. It’s been a long year for Whalen, but one that has been worth all the effort, as Gov. Andrew M. Cuomo is expected to sign the bill into law this week.